Most bands, when they want more attention, pump up the volume. 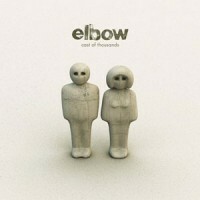 Not Elbow. The Manchester quintet's second full-length is quieter than their debut, 'Asleep At the Back', luring listeners into its clutches with weird sonic details: the twinkling electronics that open "Ribcage", stuttering guitar feedback on "Not A Job." Equally seductive are singer Guy Garvey's vocals, full of hushed gravity as he mutters thumbnail sketches of characters ranging from nasty buggers ("I've Got Your Number") to his band mates ("Snooks"). Underlying all the subtle touches are some deceptively catchy tunes: the clap-along shuffle of "Buttons & Zips;" a love song from the other side of the world ("Fugitive Motel"), and another that spins as slowly as a lonely satellite ("Switching Off"). 'Thousands' also includes cameos from members of Doves and Alfie, and, on the final bars of the swelling "Grace Under Pressure," a Glastonbury festival audience - the second time through, you'll probably join in, too.